You can skin and field dress squirrels, rabbits, upland game and smaller animals with many different styles of knives. Here’s how to pick one that can do the job well for you, while not breaking the budget. Harvest a limit of squirrels, rabbits or upland game, and you’ll soon learn what knife works best for field dressing and cleaning the carcasses. Some skill and a sharp knife makes the job easy; a large, unwieldy piece of cutlery makes it a chore. Generally speaking, when it comes to processing small game, smaller is better. 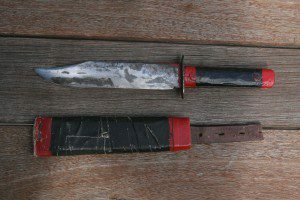 A large Bowie-style knife is worthless for this task, and it only takes one session with your large survival knife to prove that. Likewise, the wide, stubby blades of a big game skinning knife won’t work all that well either. During my formative years of small game hunting in central Iowa, I was enamored with the concept of a large hunting knife with a sheath. I couldn’t find one I could afford, so that lead, at age 13, to my first foray into knife-making. After a lot of grinding and work, I made a clip point hunting knife with a six-inch blade. I didn’t have any leather, so a temporary sheath was made out of cardboard and tape. Today, 40-some years later, that combo resides in my gun cabinet. Though the blade held an edge well, it didn’t take me long to realize it was too big for much besides stabbing bears and hand-to-hand combat. It was also bulky and heavy, and was hard to carry. I habitually carried a pocket knife, as all farmboys do, and ended up using it for all my small game work. A standard middle-sized Stockman with a clip, a sheep’s foot and a spey blade was all I ever needed until I took up big game hunting. Ease of sharpening: In Iowa, the daily bag limit for rabbits was 10, and many times, my hunting buddies and I would limit out. The same thing could happen with pheasants or quail. A successful hunt could mean a long processing session. 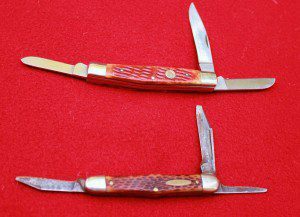 A three-bladed pocket knife was a good tool choice, because when one blade got dull, I could switch to another. But no matter what knife you choose, it needs to be easy to sharpen and must hold an edge well. (From top) the Opinel, Imperial fish knife and Puma Bird Hunter could all serve as small game knives. Easy to carry: When small game hunting, I like to field dress the animal as soon as it is killed. That means the knife must be at hand, and easy to get to and use. In small game animals, there isn’t all that much skinning involved. You pull the hide off rabbits and squirrels and most other animals under about 10 pounds, so a skinning-style blade is not necessary. I also prefer to stop sometime about mid-day and skin and completely takes care of the carcass. The carcass is placed in a cloth or culinary plastic bag, such as rice comes in, and cooled. Comfortable handle: Many smaller pocket or rigid-blade knives don’t have very ergonomic handles. 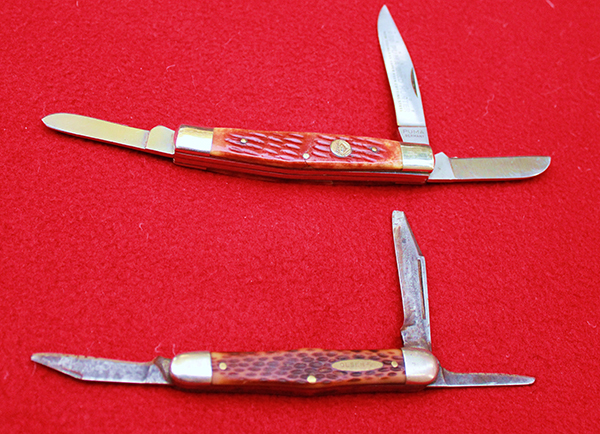 Especially in a pocket knife, the handles tend to be thin and slim for easy carry in a pocket. I like a bigger handle for a work knife, and many of the pretty, good looking handles on smaller knives won’t be comfortable to use for extended periods of time. My Puma Bird Hunter, (top) resembles my Dad's Sullivan pocket knife. Dad carried that Sullivan for years as his everyday, do-everything knife. blade onto a finger. I also don’t like how blood, guts, fur and feathers can gunk up the hinge, or get in the space where the folded blade resides. If your knife is intended to be an all-purpose tool, it could end up being very unsanitary for cooking. That said, I frequently carry my three-blade Puma Bird Hunter small game hunting, because it is so handy and the steel holds an edge so well. Sometimes, I’ll take a lockblade Buck Lite, because it is really lightweight and holds an edge well. Opinel: Made in France, the Opinel is an inexpensive, wooden-handled folder with a twist-lock blade. That makes it, IMO, the safest lockblade on the market. It comes in several sizes, but my favorite, and the one I use the most, is the three-inch blade model. The drop blade point and belly on the blade makes it a useful tool. 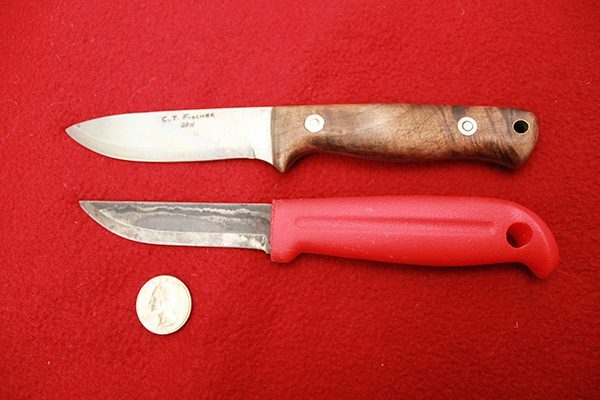 Mora: My go-to “survival” knife is a Mora-style knife with a three-to-four-inch blade. I like one with a soft, smushy handle, though that isn’t a deal breaker. Since I usually wear vinyl gloves when handling butchering tasks, I don’t tend to get slippery hands. The C.T. Fischer Bushcraft is my pet custom knife, but the J. Marttiini utility knife below it is equally useful on small game. regularly use, but the Finnish Janne Marttiini utility knife is a favorite. With a 3.75-inch blade and a large orange handle, the Marttiini cuts well, and will be easy to find if dropped. C.T. Fischer Full-Tang Bushcraft knife: Everybody who likes knives should have a couple nice ones. I treated myself last year to a four-inch, full tang Bushcraft, and have no regrets. I love the knife and in addition to being a wonderful small game hunting knife, it also is my all-around tool that goes in my daypack. The steel is superb and the handle is incredibly well-fitting for my large (glove size) hands. When it comes to processing small game, there is a wide assortment of choices. When you get right down to it, an Exacto knife with interchangeable blades could serve you very well. Or you could use a Stanley utility knife from Walmart. But what fun would that be, and how would you be able to justify shopping for and buying another knife? Make your knife choices based on the kinds of game you anticipate harvesting, the conditions you will hunt under and what you like. Then you can’t go wrong. 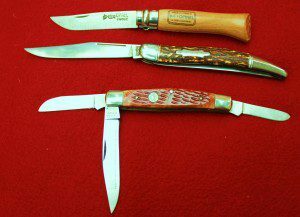 8 Comments on "How to choose a good knife for processing small game animals"
A good blade is a sharp blade. Ease of sharpening should always dictate the purchase of a working knife. This generally means a higher carbon content but, also means it will rust easier. Keeping a check for rust is a good idea but, a little rust beats a dull knife. I have Dressed out lots of Game over the years along with a narrow bladed hatchet and a hack saw. My Most useful knife is a Three bladed 3 1/2 inch when closed stockman hollow ground surgical stainless steel. one pointy jack blade, one curved flesh blade and one blunt nose stripper blade, those along with a diamond sharpener I can tackle most game. For small game I have a hand made fixed blade knife with 3″ blade my father made for me years ago. Excellent for squirrels and rabbits. I agree with Postona. No knife is a good one if you don’t keep it sharp. Learn how to put and keep an edge on a knife, and then find a selection of knives that is comfortable for YOU. The age old claim that you get what you pay for is only true to an extent with knives…Yes you want a quality knife, but you don’t need to spend top dollar for one.. Most any knife that fits your budget, and fits well in your hand, providing you learn how to keep it sharp, can be your best friend. As Lawrence said you get what ya pay for. The cheap $5 knifes may get sharp but wont keep their edge.